Ada Township, home of Manus Realty, is a beautifully rural community nestled between two rivers (the Grand and Thornapple) located several miles east of Grand Rapids. 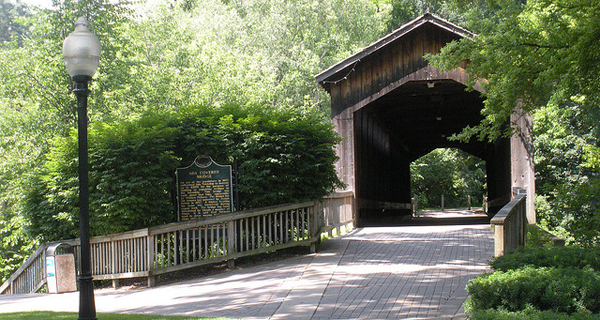 Ada has 10,000 plus residents and is known for its natural charm, treelined streets and historic locations such as the Ada Covered Bridge. Ada is very proud of their Top rated schools, both public and private. Over the many years, Ada has grown into a peaceful community full of must see attractions such as award-winning Ada Farmers Market, Art Galleries, Unique Shops, Historical Museum, Music on the Lawn every Friday in the summers, Diverse Dining and many Hiking/Biking Trails. Ada Township Park, located on the corner of Buttrick Ave. & Grand River Dr, is a 57-acre park with soccer fields, tennis courts, a basketball court, playground, fishing pond and both paved and natural trails. Fishing is restricted to those under 12, senior citizens or physically challenged individuals. Plenty of tables & grills plus a pavilion and two gazebos provide ample opportunity for your picnic.